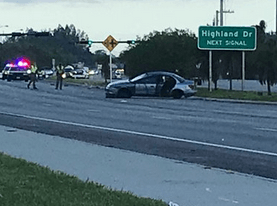 Dad And Two Kids Killed After Car Hits Highlander In St. Lucie County | Schuler, Halvorson, Weisser, Zoeller & Overbeck P.A. A dad and two of his children were tragically killed when their car hit a Toyota Highlander in St. Lucie County. The 36-year-old and two of his children, ages 19-months-old and 1-year old, died at the scene. The driver of the Toyota Highlander was also killed in the accident. Three passengers in the Toyota Highlander survived minor injuries in the accident. The 36-year-old man’s two-year-old son survived the crash and was flown to Delray Medical Center in Palm Beach County by helicopter to treat minor injuries. An uptick in car accidents involving another vehicle in the area has officials growing concerned. A Florida Highway Patrol Captain told The Post, that the main cause of the car crash is still under investigation and urges anyone with relevant information concerning the crash to contact the FHP department.